The Samsung NX11 is a very modest update of the year-old NX10, with the principal addition being the i-Function option that enables you to change the camera's key settings via the focus ring on the new kit lens. Although this does make more sense when used in tandem with the NX11's viewfinder, it's still something of a curiosity rather than being genuinely useful. Having said that, the NX11 offers intuitive handling, especially for beginners, great image quality and fantastic value for money, and is still competitive with the best that the other manufacturers can offer. The NX11's stylish DSLR-like design, logical user interface and excellent build quality are testament to the lavish attention that Samsung have obviously invested in the NX system. The NX11 may not be quite as slim as the smallest Micro Four Third models from Olympus and Panasonic, but it does offer a more prominent handgrip and even more useful built-in viewfinder. The all-plastic construction doesn't affect the overall quality feel too much, and it ensures that Samsung can offer the NX11 at a very tempting price which seriously undercuts its main rivals. The jury's still out on the i-Function button, though, with opinions divided about whether it's a genuinely useful innovation or just another way to differentiate the NX system from its competitors. The new 18-55mm kit lens now features the i-Function button, but loses the useful OIS button of its predecessor. The NX10 is already compatible with i-Function thanks to a firmware upgrade, so there's really no reason for those users to upgrade, while NX100 owners may be tempted by the more DSLR-like design of the NX11, although image quality is very similar across all three models. The NX11 has all the advantages that a large APS-C DSLR sensor offers, namely better performance at higher ISOs than the smaller Micro Four Thirds format. I'd be happy to regularly shoot with any setting from 100-800, and even 1600 is handy at a push when you want natural results without having to resort to the built-in flash. Note that the RAW files are massive, weighing in at 25Mb each, which is as large as files from the 21 megapixel Canon EOS 5D Mark II. The Samsung NX11 undoubtedly represents excellent value for money, with an RRP of £549.99 / $649.99 with the 18-55mm OIS lens being even less than the NX10 was on launch. Despite the introduction of cheaper rivals like the Olympus E-PL2 and Panasonic Lumix DMC-GF2, the NX11 still provides one of the cheapest ways into the compact system camera format. 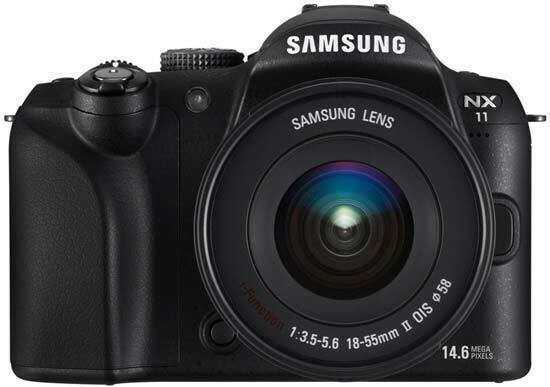 Although the Samsung NX11 won't win any awards for originality, it is the best Samsung compact system camera yet and does just enough to remain competitive in an increasingly crowded market. With strong recent rumours of the NX20 and NX200, the NX11 might have an even shorter lifespan than the NX10, but don't let that put you off what is a very accomplished camera. Highly recommended.